Our QuickTrex opticalCON DUO® fiber optic assemblies harness the power of the Neutrik® brand tactical connector, with tactical grade fiber to provide a superior rugged product. QuickTreX® Tactical & Rugged Pre-Terminated Fiber Optic Assemblies are designed to withstand the harshest of environments. This assembly is military approved, and is ideal for audio and broadcast networks. 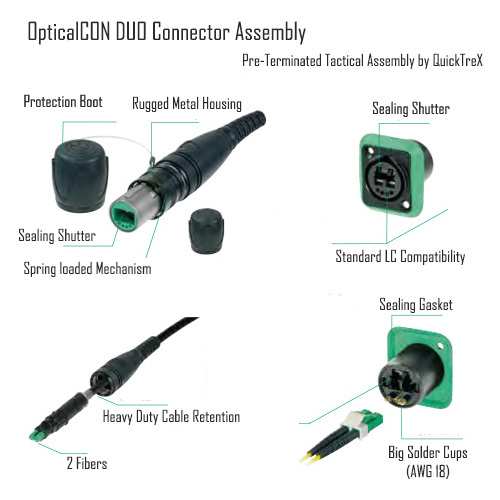 The opticalCON DUO cable connector houses a standard optical LC-Duplex connector in a ruggedized and durable all-metal housing. A spring-loaded push-pull locking mechanism provides superior protection for the connectors, and the fiber provides excellent cable retention utilizing aramid yarn. An automatically operated sealing cover protects the connectors from all contaminants like dirt and dust. Our Tactical and Rugged Assemblies can optionally be installed on a heavy duty Schill deployment reel, designed for quick deployment and retrieval. These Schill reels include a door which houses the connectors for safe and secure storage while not in use. Our Tactical & Rugged Fiber Assemblies include an optional cover sleeve and wire mesh handle on the pull end of the assembly which allows for fast deployment while also protecting the connectors from damage. This assembly is made in the USA by skilled technicians under controlled conditions, and comes to you fully tested and ready for immediate use. The test results are placed on the inside of the door.